Several grades are available, but we usually stock TMT YELLOW and TMT PURPLE. Both are available in 5 lb. boxes and 55 gallon drums. TMT PURPLE is the coarsest grain size Borax makes, then TMT YELLOW, followed by TMT RED. To a degree, the coarser the grain size the more "abrasive" the soap and hence, the more cleaning action. After years of providing all three, TMT PURPLE has been the one most often requested. Generally, a highly alkaline synthetic, non-sudsing, detergent having a pH of about 10-11 is satisfactory. Actually, any such synthetic detergents ("All", "Borax" or "Ivory") will work equally as well. We suggest BORAX primarily because it is so readily available, we are able to offer better pricing, packing is more conducive to a mill environment, and because it is available in several different grades (see above). What's the need for Soap at all? We recommend the use of soap for cleaning Rubber Belts of all brands. The cleaning process is important as it serves to remove any "sizing" build up that has developed on the belt's surface. This prolongs the grinding frequency which, in turn, lengthens the belt's life and prevents unnecessary downtime. In addition, Soap is used to relieve the "surface tension" on the belt's surface after grinding. Otherwise, the cooling water may not adhere as well to the face of the belt. We invite you to request samples. To do so, please see FAQ . Like the Soap discussed above, Talcum Powder is also available in any number of different grades. Too fine a grade causes coagulation of the Talc while grinding; too coarse a grade prevents obtaining the desired finish on the belt's surface during the end of the grinding procedure. For these reasons, we experimented with numerous grades before settling on the one we have sold for years. Again, we welcome the opportunity to provide you a sample. To request your free sample simply visit the FAQ Section. The word "wax" is actually a misnomer as technically this product is not a wax. Instead, it is a chemically formulated compound, with wax-like properties, designed specifically by us for use as a lubricant on any Rubber Belt. It contains no petroleum-based ingredients, vegetable or bee's wax, which other "knock-off" products contain, and which are detrimental to natural rubber. Be careful what you buy, as all products slated for this use are not the same. For additional information on this SHIELD� Product, please see the separate write-up entitled SHIELD� COMPRESSIVE SHRINKAGE WAX. Test Products available upon request. Please see FAQ to learn how to order. Durometers are available in a myriad of types for measuring the hardness of just about everything. For our purposes, however, we are focused on durometers for measuring the hardness of natural rubber and specifically Rubber Belts used for Compressive Shrinking. We offer three types of Type A Durometers: Shore Pencil, Shore Round(center) and Kori Quadrant (right). 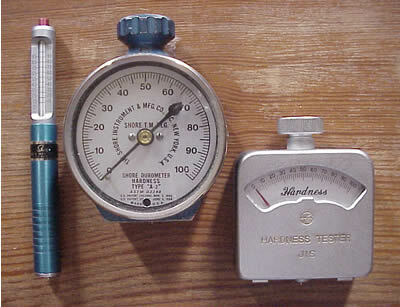 Shore is the originator of the Durometer Hardness Tester. Their durometers are built to last a lifetime and can be returned to the factory for calibration and repairs as needed. The Round style durometer is supplied with a test block for checking the accuracy of the gauge and a vinyl covered steel case for protection. The Pencil style is supplied boxed with a sheath and a cleaning brush. Kori durometers are manufactured as a more economical alternative to Shore. Still an accurate and effective tool, but without the capability of being calibrated and/or repaired. 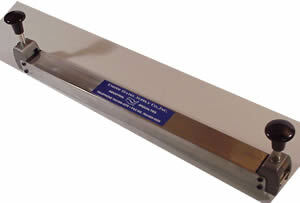 It is supplied with a UHMW protective case. Buy the Shore Round style if you can afford the US$400.00 premium. Positives: Easy to read; repairable; can be calibrated. Downside: Does not hold the reading once removed from the source. Kori is an excellent alternative for an excellent price. Downside: Not repairable; does not hold a reading once removed from the source. ShorePencil is easy to carry due to its small size. Positives: Holds reading when removed from source; good price point. Downside: Difficult to read.